I sold a pair of shoes on Kajiji and with the money I bought this pretty. It's it a beautiful plant? Turns out this plant dates back to when the dinosaurs roamed the earth! Crazy right?! AND one plant can live up to 1000 years! It's that amazing? I thought seeing as this is such an incredible plant I would shared a bit more about it. Here is a great video to get you started. The Sago Palm prefers bright light, but will also tolerate moderate levels as well. Try to keep the plant near light or else new growth will dramatically lean towards the light. It also is a good idea to turn the plant slightly every couple of days to keep the plants shape. 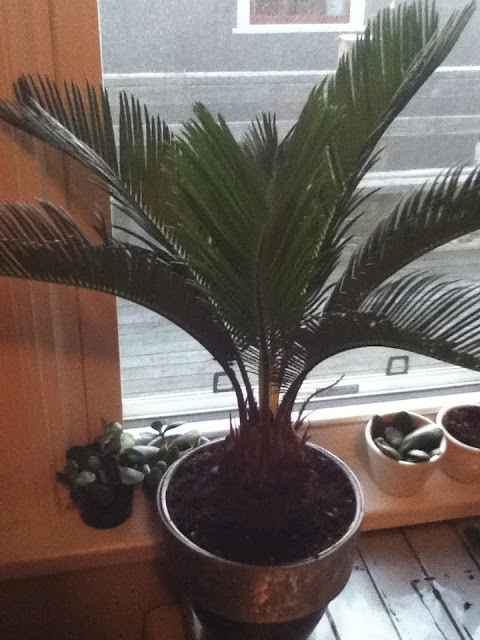 You should allow your Sago palm to dry out (not 100%, maybe 85%) in between waterings. If you are successful at growing cactus or succulents, you'll do well with this plant. Their watering also should follow according to the amount of light they receive. If it is placed in an area with lower light levels, you may only need to water it every couple of weeks. If matured foliage begins to yellow you are probably over watering the plant. (Take care to water the soil, not the crown of the plant which can lead to crown rot and may kill the plant). This houseplant is pretty hardy. It doesn't seem to have a real temperature preference and do not have any humidity requirements but does prefer humidity if you can give it. During dry months, a daily misting will add some extra lift to your plant. Up to 6 ft (1.8 m) indoors. Can be kept dwarfed by growing it in a small pot. 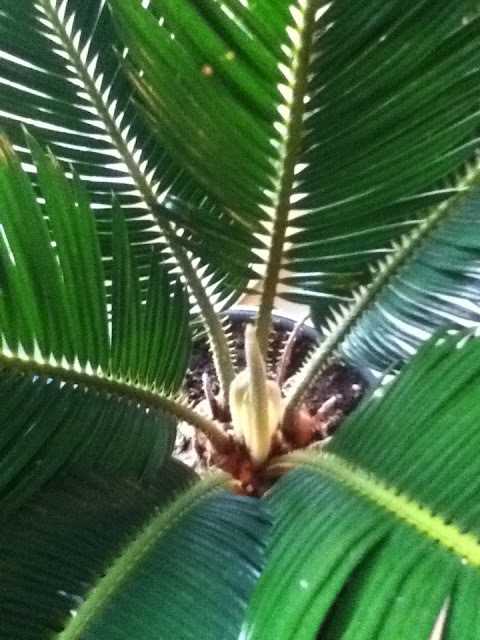 Sago Palm is also popularly grown as a bonsai tree. Cactus mix works well. Or combine 2 parts peat-moss based potting mix and 1 part sharp sand or perlite. Seeds take months to germinate and years to grow into a tree. Everything about this plant is s-l-o-w. Mature plants grow offsets -- called pups -- that can be separated and planted into their own containers.